Execute an individualized pre-performance routine. Each athlete needs a consistent routine, including sleep, nutrition, and warm-up. Some athletes benefit from mentally rehearsing and preparing (imagery), and others benefit from complete distraction (TV, movies, reading, studying). Some athletes like to be high energy and some like to be calmer. Some need to listen to music and others need to joke around. Don’t know much about Sport Psychology? Learn more about the elements that extend beyond the playing field at https://wexnermedical.osu.edu/sports-medicine/treatments/psychology. Eat throughout the day to maximize energy. Include plenty of carbohydrates in the diet. Eat the right amount of protein for your goals. Know what sort of pre-event meal works best for you by practicing on non-competition days. Drink plenty of fluids throughout the day, every day. Plan for great recovery after any type of practice or event by having the proper snacks or meals available. Know your body and plan to meet your goals. 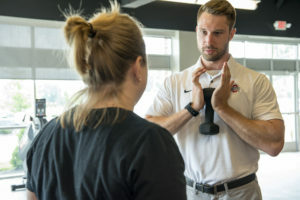 Learn more about how a Sports Dietitian can help at https://wexnermedical.osu.edu/sports-medicine/treatments/nutrition. The two are inseparable, and you can’t train effectively without both. If you’re here, you’re an athlete, so here are a few good sleep habits to ensure you’re not faced with a choice between sleep and exercise. BED=SLEEPING No technology or TV or reading in bed so your body associates bed with sleep only. SLEEP WHEN SLEEPY Only try to sleep when you feel tired. GET UP AND TRY AGAIN If you aren’t asleep after 20 minutes, get up and do something calming or boring until you feel tired and try again. Avoid watching the clock. For at least 4-6 hours before going to bed. NO NAPS If you can’t make it through the day, make sure it is less than an hour and before 3 p.m.
SLEEP RITUALS Sit calmly or perform relaxing stretches or breathing exercises 15 minutes before bed. USE A SLEEP DIARY Track your progress for two weeks, then revisit two months later to see how you are progressing. EXERCISE Morning walks are best. No strenuous exercise 4 hours before bedtime. BATH TIME A hot bath 1-2 hours before bedtime can be useful. EAT RIGHT A warm glass of milk can act as a natural sleep inducer because it contains tryptophan. Read more from one of our sports medicine doctors at https://wexnermedical.osu.edu/blog/sleep-vs-exercise.